Back in the day, I was somewhat of an athlete. 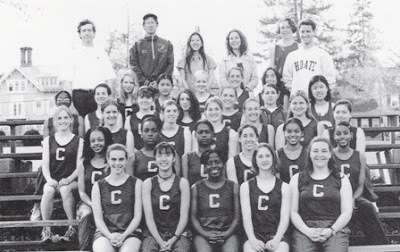 In the four years I spent at Choate Rosemary Hall, I played field hockey and basketball and ran on the track team. While I certainly wasn't the faster runner on the team, I was a member of a school-record-breaking 4x4 relay team and I managed to bring home some medals from local invitational meets. When the opportunity to participate in the EIF Revlon Run/Walk in New York City presented itself to me, I plunked down some hard-earned cash and bought new running shoes and running gear (have to look good, right?) and registered for the event. Those of you who follow me on Twitter have been enduring update after update about my training progress and my fundraising efforts. Of course, now that I'm training on a regular basis, I'm hungrier than normal and, although they're not my favorite fruit, I'm eating more and more bananas. Bananas are especially important for runners - they offer quick carbohydrates to help fuel your run and they keep you hydrated since they're 75% water. Bananas also have plenty of magnesium and potassium, which are two electrolytes lost in sweat that play a huge role in late-run/late-race cramping. No matter how much I dislike the smell and texture of a banana, I know that it's in my body's best interest to eat them on a regular basis. Generally, I don't like to eat bananas "as is," so I try to sneak them into my diet. One of the ways I do that is by using a banana to thicken my homemade fruit smoothies. With just three simple and easily obtainable ingredients and the aid of my blender, I can create something delicious and nutritious that I can drink on the go if need be. Who wouldn't want to begin the day with this? If you're not a fan of berries, have no fear! Just change up the recipe to include your favorite fruit. Do you have a favorite smoothie flavor? How do you make them? Leave a comment and let me know! Also, if you're a fan of Taste As You Go, please consider making a contribution and joining me in the fight against women's cancers. Your contribution will help fund important research into the cause and cure of women's cancers, prevention, education, and support service programs. Every pledge will help bring us one step closer to a cure. Thanks in advance! Place frozen fruit and banana in blender. Pour in enough orange juice until the frozen fruit is just covered. Place cover on blender and blend until smooth and there are no more chunks of frozen fruit, about 20-30 seconds. If you're in more of a chocolate mood, a banana and chocolate syrup (and milk) works pretty well. If you want a more "shake" like consistency without the calories, ice cubes work wonderfully. And if you want more protein a tablespoon of peanut butter is always a good flavor match.